By Dennis W. Viau; modified from a recipe in a restaurant trade journal. 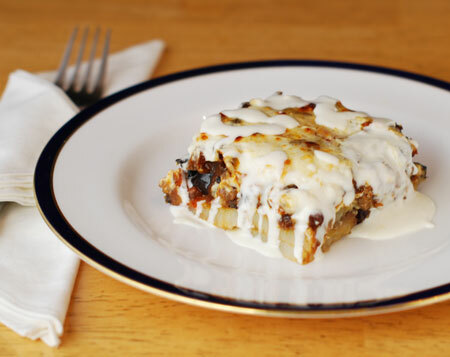 Moussaka is a Greek eggplant dish made with a meat sauce, potatoes, and a béchamel sauce that can contain yogurt. I love eggplant and saw this as a good opportunity. The original recipe had several problems, but after those were solved the final moussaka was delicious. (I think of this recipe as a Greek version of shepherd’s pie.) It’s elaborate and complicated, but worth the effort for a special occasion. If using currants, place them in a bowl and add the wine. Allow to soak half an hour or until needed. Heat 2 tablespoons cooking olive oil in a large skillet and sauté the ground meats over medium heat until lightly browned and any juices that escape the meat are evaporated. Transfer to a bowl and set aside. Add 2 tablespoons oil to the skillet and sauté the chopped onion until tender and translucent, 8 to 10 minutes. Add the garlic and cook an additional minute. Drain the currants, adding the wine to the skillet and setting the currants aside (or add 1 cup dry red wine). Bring to a boil, reduce the heat to medium-low and simmer until nearly all the liquid has evaporated. Crush the canned tomatoes with your hands and add to the skillet with the juice. Cook 8 to 10 minutes. Add the cooked ground meats and combine. Add the currants, if using. Season with ras el hanout. Cook over low heat 20 to 30 minutes, adding a little water if the skillet appears dry. Adjust for salt and let cool. The meat sauce can be prepared a day or two in advance. Cut the eggplant, either across or lengthwise, into 3/8-inch (1cm) slices. Sprinkle each slice generously with salt and place in a large bowl. Cover with plastic and set aside for about an hour. Melt the butter in a medium saucepan and add the flour. Cook 1 to 2 minutes. Remove from the heat and let cool a few minutes. Stir in the nutmeg and the pepper. Add the milk and cream. Combine well. Return to the heat and bring to a boil, stirring constantly. Reduce the heat to low and cook, stirring the whole time, for 10 minutes. Remove from the heat and adjust for salt. To prevent a skin forming on the surface, carefully press a piece of plastic wrap onto the surface of the béchamel. Set aside to cool. When cooled, stir in the yogurt and combine until smooth. Rinse the eggplant slices thoroughly under running cold water to remove the salt. Place on several layers of paper towels to drain. Peel and slice the potatoes about ¼-inch (0.6cm). Place half in a large microwave-safe bowl with about ¼ cup olive oil. Turn to coat evenly. Microwave 2 to 3 minutes, turn the slices and microwave again. Do the same with the remaining potato slices. Set aside to cool, preferably in the refrigerator. Fry the eggplant slices, enough for one layer in the bottom of the skillet, adding more oil as needed, until lightly browned on both sides. Transfer to a paper towels to drain. Continue until all the egg plant is fried. Fry the potatoes, enough for one layer in the bottom of the skillet, until lightly browned on both sides. Transfer to paper towels to drain. Heat the oven to 350°F (177°C). Arrange a single layer of fried potatoes, overlapping them a little, to fill the bottom of a 9 by 14-inch (23 by 36cm) rectangular baking dish or springform pan. You might not use all the potato slices. Arrange the eggplant in two layers on top of the potatoes, again overlapping the edges. Spoon the meat sauce over the top, distributing evening and smoothing the top to a flat surface. Spoon some of the béchamel sauce on top to form a thin layer. (Reserve the remaining béchamel for garnish when serving). Sprinkle the top of the moussaka with the grated cheese. Baked the moussaka until bubbling around the edges and heated through, 25 to 35 minutes. During the last few minutes the moussake can be placed under the broiler to slightly brown the top surface. Remove from the oven and let stand 10 minutes before serving. Cut squares of moussaka and plate, garnishing the top with some of the béchamel sauce set aside earlier.